Hey beautiful! I believe anyone can read Tarot – including YOU! No special gifts required. All you need is to say YES to your intuition and trust yourself. Everything I teach on Biddy Tarot is designed to help you access your intuition, read Tarot with confidence, and create the life you want to live. Tarot is perfect for self-development, making choices, manifesting goals, coaching others, planning a business, meditating—you name it. Simply ask a question, pull a card, and dive into the imagery of the card to give you instant access to your inner wisdom and the answer you need. While many people believe that Tarot will tell you the future, making predictions are not really what Tarot cards are about. When it comes to Tarot, fortune-telling is out, and intuition is in, especially if you want to create your ideal future and manifest your goals. Choose a Tarot deck that’s right for you. The Rider Waite deck is a great place to start for the Tarot Beginner. Get to know your Tarot cards. Spend time looking at each Tarot card – the symbols, stories and images – and get a feel for the ‘energy’ of the card. Take note of the names of the cards so you can easily recognise them when you pull them from the deck. Learn the Tarot card meanings. Discover the traditional meanings, symbolism, and the numerological and elemental associations of the cards. You don’t have to memorise everything – simply learn the basics to get you started. 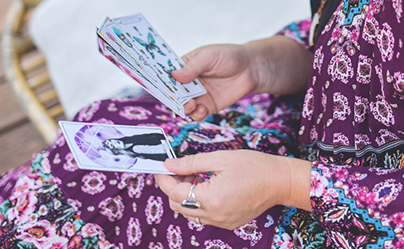 Take these four steps and, over time, you’ll create a stronger connection with your Tarot cards and your intuition, so that you can live an inspired life. And, I want you to know, I’ve got your back! Check out the following resources, designed specifically for Tarot Beginners just like you. I know it can feel totally overwhelming when you start to learn to read Tarot. But I want you to know – you’ve got this! And I’m here to support you 100% of the way. It’s my vision that, one day, everyone will have access to the power of Tarot and intuition. And it’s my mission to make Tarot a part of mainstream conversation, just like yoga or meditation. …it’s normal to trust your intuition and listen to your inner wisdom. …it’s normal to whip out the Tarot cards any time you need some intuitive guidance. …and it’s normal to be inspired and energised by all things ‘woo’! This vision is what drives me, and the entire team at Biddy Tarot. We know the power of Tarot and how it can change lives. So, are you with me?! Are you ready to join the revolution and be part of making a real difference in the world with your Tarot cards as a guide?! Then let’s travel this path together!